Occasionally, there's something that comes along that simply reminds you of the joy of fandom. The execution may not be perfect, but it's nevertheless touching, or thought-provoking, or simply fun. "Tip of the Hat" is our occasional series to shine a light on those things when we find them. 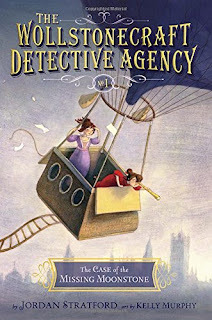 This month will see the release of The Perilous Palace, the final book in the Wollstonecraft Detective Agency series of middle-grade books by Jordan Stratford and illustrated by Kelly Murphy. As the series concludes**, what better time to celebrate it, and tip my hat to a job well done? As a parent of my children — and they are very much my children in the apple-doesn't-fall-far-from-the-tree sense — it has been a joy to read them books that I loved as a kid like A Wrinkle in Time, The Hobbit, Charlie and the Chocolate Factory, and watch them fall in love with those stories, too. And there have been other classic kid-lit books that I personally missed, but thankfully found in time for them, like The Phantom Tollbooth. As a kid I loved the fantastic, but I also adored mysteries, and I read (I think, without hyperbole) every single Hardy Boys book that was in print through the mid-to-late 1980s. So, I gave one of my kids one of the original Hardy Boys books a couple of years ago, and they put it down immediately. I opened it up, read a few pages, and then didn't blame them one bit. As it happens, there seemed to be a lot more distance between 2015 and 1927 than there was for me between 1985 and 1927. It's no wonder, really. The world has moved on. Enter Jordan Stratford, and his amazing "what-if" scenario: what if, as children, Mary Wollstonecraft (later Shelley, who invented science fiction) and Ada Byron (later Lovelace, who invented computer programming) had known each other...and solved mysteries. I'll be...ahem, my kids...will be all over this, and I expect the wait for Book 2 will be a difficult one. They were, and it was. 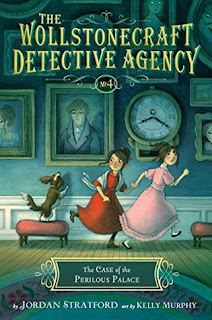 Similarly for book three, and there was an actual cheer that went up in my house when I told them book four was coming. 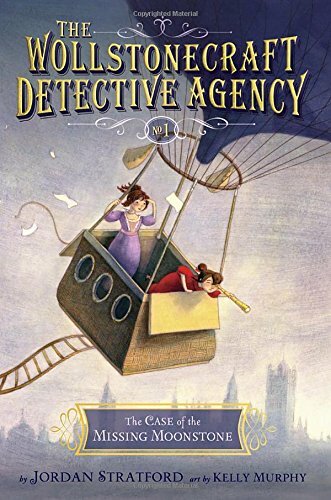 These books are well written and fun, loaded with so many historical and literary allusions that while I seem to catch most of them (if I'm not giving myself too much credit), the kids are able to catch some of them, too, like the appearance of a young Charles Dickens. When it comes right down to it, there are just a lot of things that this series did fantastically well. Certainly, they are good stories well-told and the books are all connected in a way that feels organic and rewarding, but beyond that, these are stories of smart, determined girls doing awesome stuff when nobody thinks them capable of it. The books prize logic and scientific inquiry, and highlight actual individuals from history that left profound marks in the sciences and literature (and resources at the back of each book suggest how to learn more about these actual people). And, on a personal note, Ada is clearly on the spectrum, and raising a child who is, as well, I can tell you that it meant something very profound to be able to read passages in which another kid — the hero of the book, no less — reacted in similar ways to similar stimuli, and thought of things in the same way, and struggled in the same way in many of the same situations. So I tip my hat to Jordan Stratford and Kelly Murphy. And while I'm sad the series is concluding, I'm very grateful to have one more trip to take to a pre-Victorian London with this group of kids, and my own. ** After we published this, author Jordan Stratford reached out on Twitter to say that, despite what the Penguin Random House page for the new book says, the series will not be concluding. We regret the error. Posted by Vance K — cult film reviewer and co-editor of the proudly Hugo Award-nominated nerds of a feather, flock together since 2012.